I thought to myself when buying the last lot of pancetta that I would ask my Italian friend how to make it. It is expensive even though something of an indulgence...so I bought a piece of pork belly weighing 1.28 kg. The idea is this...you can either remove the skin or not, up to you. Cut out the rib ends. I have not removed the meat from where the gristle was as I will not be rolling it. Then rub both sides of the piece of meat, which has had the edges cut so they are nice and straight, with the spice/salt mix. You will need some pink salt (bacon cure, in old parlance saltpetre...) which I guess you could not have to use but you would have to add another teaspoon of salt, I am thinking! The saltpetre helps to maintain a nice colour and does keep the meat safer from lurgies. So you have got the spices and salts rubbed in, then place the meat and any errant mix in a ziplock bag or a non-reactive container. Leave for five days turning the meat twice a day...while you are turning it, without removing it from the bag, rub the mix in some more. On the fifth day, squish the meat; if it is still spongy, leave it another couple of day. The foto depicts the meat at three days. You can see how the salt is drawing moisture out of the meat. Last edited by EeeBees; 06-01-2014 at 09:51 PM. Wirehunt, veitnamcam, R93 and 4 others like this. I made one of these in an old fridge. I Like the bag method tho, probably makes it more translucent. Mine was too salty. It takes a bit of tweaking to get that bit just right. I thought you are supposed to flatten it with weights as well, or am I confused with a different pork product? Barefoot - I think it's prosciutto thats cured as a whole ham with a weight on top. Makes my mouth water just thinking about it. Forgot to add need to go and buy some muslin for the drying part. It will need at least five or so days drying...thankfully even in the heat we have had over the last few days the porch to the shack is still cool, but as my friend says it is more about the humidity...which sounds very technical to me!! I've used some of that painters cloth as muslin before. I am as excited as a moosehunter bringing down a orignal with a sixty inch rack spread, honestly!! It being the seventh day, I washed the spices and salts off the meat then dried it off with kitchen towels. then I fried a couple of pieces to do a taste test...tres bon!!! Mix altogether well before rubbing into all surfaces of the meat. I would not leave the strips of meat between the ribs on the piece of meat again. If it turns out a bit too salty, you only need to slice and blanche in water until the water comes to the boil, drain then fry or grill as per normal. Last edited by EeeBees; 11-01-2014 at 02:28 PM. veitnamcam and kiwi39 like this. Oh dang, just realised I missed the 1tbsp of crushed juniper berries...opps!!! Pour some Gin on it then EeeBees. That is made from Juniper isn't it? @EeeBees inspired belly pork pancetta in progress. 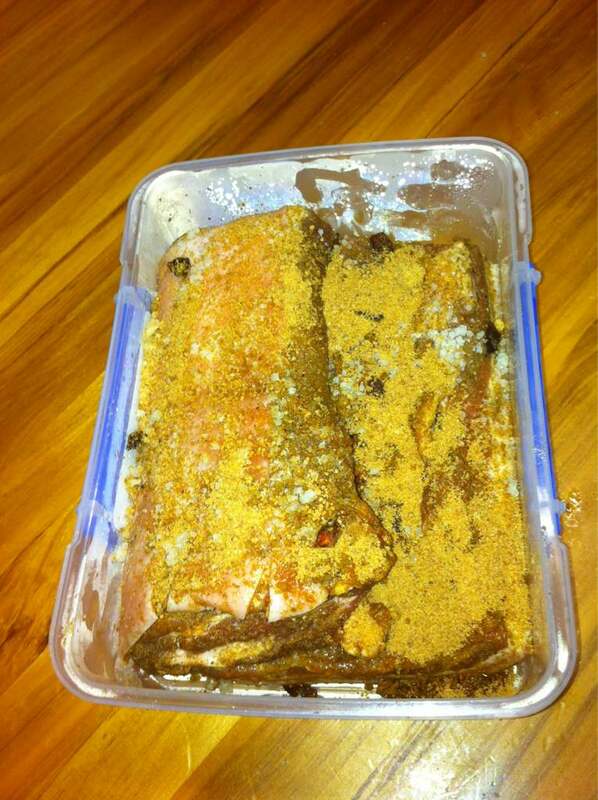 Pork, salt , pepper, brown sugar, cinnamon, nutmeg and star anise. No garlic. Yay!!!! Looking good... Cannot wait to hear the outcome!!!! well done on the experiment guys, will be watching this thread with interest....and anticipation! EeeBees and Biggun708 like this. Ill never rue a bad day at work again...no bull!!! !